Isn't annoying when you use history to drive your point home and then someone actually does some fact checking? "President Barack Obama has turned fearmongering into an art form. 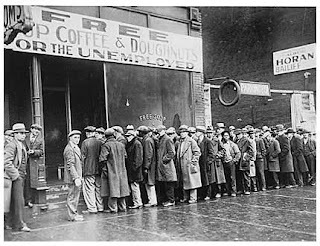 He has repeatedly raised the specter of another Great Depression...It is bad history because our current economic woes don't come close to those of the 1930s. At worst, a comparison to the 1981-82 recession might be appropriate. Consider the job losses that Mr. Obama always cites. In the last year, the U.S. economy shed 3.4 million jobs. That's a grim statistic for sure, but represents just 2.2% of the labor force. From November 1981 to October 1982, 2.4 million jobs were lost -- fewer in number than today, but the labor force was smaller. So 1981-82 job losses totaled 2.2% of the labor force, the same as now. Auto production last year declined by roughly 25%. That looks good compared to 1932, when production shriveled by 90%. The failure of a couple of dozen banks in 2008 just doesn't compare to over 10,000 bank failures in 1933, or even the 3,000-plus bank (Savings & Loan) failures in 1987-88. Stockholders can take some solace from the fact that the recent stock market debacle doesn't come close to the 90% devaluation of the early 1930s." Via The Wall Street Journal here.